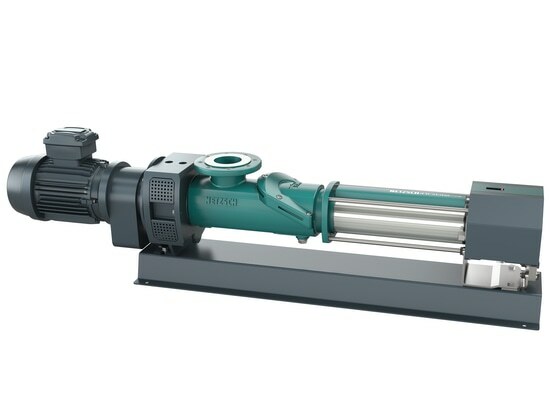 Another component was added to the product portfolio of the NEMO® progressing cavity pump from NETZSCH Pumpen & Systeme GmbH in Waldkraiburg: the xLC® unit. This unit triples the service life of the pump, particularly when conveying difficult, abrasive media. When wear occurs in the rotor-stator system, the new xLC® unit allows the performance of the pump to be re-established by adjusting the preload between the conveyor elements. It is important for the xLC® stator adjustment system that the elastomer in the rigid metal sleeve of the stator is flexible, which was made possible with the development of the proven iFD stator® 2.0. The xLC® adjustment system uses this characteristic so that the elastomer is not vulcanized into the housing but rather fixed through axial pressing. To regulate the preload in the rotor-stator system, the elastomer in the sheath is extended by pulling or shortened by pressing, which changes the preload between the pumping elements. In case of wear, compressing the elastomer increases the preload and re-establishes the reduced sealing line. How it works: If the stator has to be adjusted due to declining performance of the pump, the setting nuts of the system are adjusted, compressing the elastomer insert in the metal housing once again. A scale with seven defined stop points facilitates gradual adjustment of the stator with only two setting screws while also showing the remaining potential until a stator change is required. For over 60 years, NETZSCH Pumps and Systems has served markets worldwide with NEMO® progressing cavity pumps, TORNADO® rotary lobe pumps, NOTOS® multi screw pumps, grinding machines, barrel emptying systems, dosing technology and accessories, providing customized, sophisticated solutions for applications in every type of industry. With a workforce of over 2,000 and a turnover of more than 285 Million US Dollars (2016 financial year), NETZSCH Pumps & Systems is the largest business unit with the highest turnover in the NETZSCH Group, alongside NETZSCH Analyzing & Testing and NETZSCH Grinding & Dispersing. In case of wear, the setting nuts of the xLC® unit are adjusted, compressing the elastomer to re-establish the reduced sealing line.